(Nanowerk News) A Holy Grail of ultrafast science and technology is to image the changing structure of matter at the nanoscale during the interaction with light. 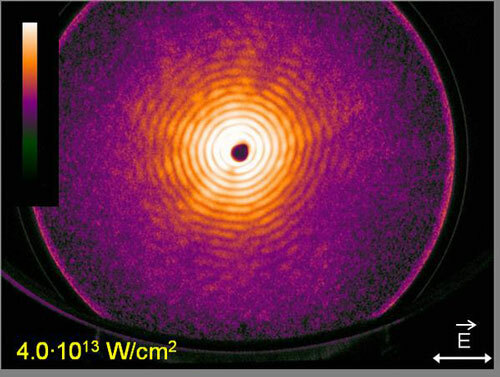 An international collaboration including DESY photon scientists led by Thomas Möller of the Technical University Berlin and Christoph Bostedt of SLAC at Stanford (formerly Technical University Berlin) used intense laser pulses delivered by the FLASH free-electron laser for X-ray scattering from nanoparticles. The goal was to look into ultrafast electronic processes during the nanoplasma formation where conventional spectroscopy techniques are inherently blind. These experiments open up new routes for the investigation of transient electronic configurations of highly excited states of matter such as the interior of stars which can now be created in the laboratory. The scientists reported on their results in last week's issue of Physical Review Letters ("Ultrafast X-Ray Scattering of Xenon Nanoparticles: Imaging Transient States of Matter"), and the key figure of the work was also considered as the journal cover image. Any sample in the focus of an intense X-ray laser flash will be converted into a highly excited, nonequilibrium plasma hotter than the sun. 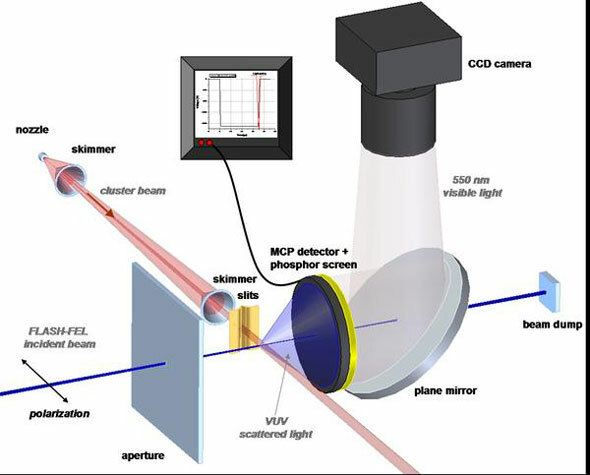 The scattering signal is affected by the changes in the electronic structure of the sample, leading to modifications of the scattered light even though the particle geometry remains the same on the time scale of the interaction with the laser pulse. Conversely, the information carried by the scattering signal can be exploited to gain insight into transient electronic states on the femtosecond time scale. In their work the authors performed single-shot single-particle scattering experiments on xenon clusters to investigate the interplay between excitation and scattering in nanoscale objects with femtosecond X-ray pulses. Because of their finite size and simple electronic structure, atomic clusters are ideal objects for investigating the interaction between intense light pulses and matter. The usual way to analyse the interaction is to detect the cluster fragments with ion time-of-flight (TOF) spectrometers. An inherent limitation of this technique is that only the final products of the reaction - in other words, the charge states of the cluster fragments microseconds after the reaction took place - is detected. This leaves plenty of time for higher charge states to be created and to recombine, never to be seen in ion TOF spectroscopy. Bostedt et al. used the scattering signal to track ultrafast changes in the electronic structure of the clusters. The recorded scattering snapshots show that transiently highly charged species are created before the cluster disintegrates in an ultrafast firework.